Sign Up. Redeem Coupons. ENGAGE! Our Mobile KIOSK builds repeat business, gets your customers coming back and makes redeeming coupons a cinch. 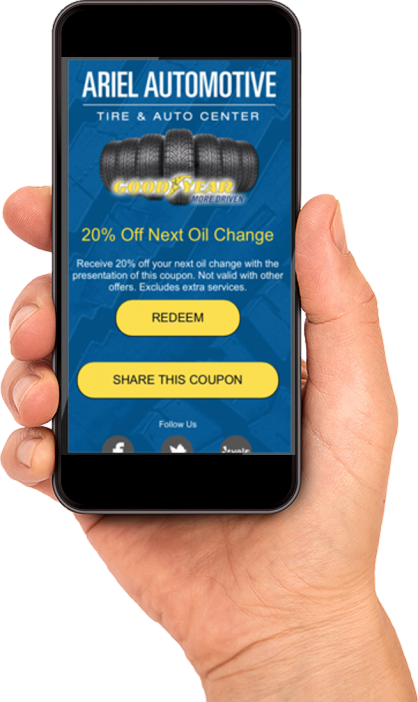 Send Great looking Mobile coupons to your customers. Let them share it on their Facebook Timeline, Send to Friends from their phones or send a link to family. The Mobile Marketing Dashboard that's MOBILE! Access your dashboard anywhere and on any device. Send new new item messages, coupons, birthday messages and more. We're here to make this easy and simple. Our staff will create, send and manage your digital marketing.. Send customers beautiful looking coupons. Track usage and redemptions with built-in redemption widget. New Viral Share gives your customers the ability to share your offers. Add driving directions, exceptions and social links. Unique Design for every business. Logos, Locations, driving directions and exclusions. Managed coupon and offer codes, sharing and designed for each merchant. CONNECT to social feeds like Facebook, Instagram, yelp, email and more. Businesses see a Return On Investment with a 98% open rate, redemption tracking, viral share and tap to call functions. MORE CUSTOMERS. REPEAT BUSINESS. PROFITS. Solutions for building customer databases with email and mobile numbers, quick and easy customer sign up in your business, or at an event FanCONNECT Mobile has the perfect solution for your needs. Designed for your brand including logo and colors. Fast and easy customer sign up. Manage Coupons and Rewards with built-in redemption tools. Send engaging bounce-back offers, We miss you and other offers to boost repeat sales. Set Your Mobile rewards, Initial Offer and then your Patrons enter the mobile number and name to receive a confirmation TEXT and initial offer. BYOD (Bring Your Own Device) or get a complete turnkey solution. We'll design the KIOSK for your business. Our Turnkey solutions include iPad, tablet stand or enclosure and complete configuration for quick and easy setup. In less than 15 minutes we'll have you up and runningand ready to start building a customer list and driving new sales, engaging your customers and building your customer base.. Customer CRM, Campaign manager, Text Reminders, Coupon Manager, Birthday & Anniversary club, Engagement tools. Reach one customer or many with built-in campaign manager, target and engage, single or multi tier loyalty, send a coupon, update an offer and more. No software to install. Quick and easy access to customers, offers, campaigns and reports. Mobile surveys are fast, easy, interactive and they engage audiences unlike ever before. Send unique coupons via text or through our exclusive coupon redemption application. Includes quick coupon editor and redemption tools. We'll turn your WiFi into a marketing machine.